Child #2 will be off to an art camp in just a few days, so I decided to whip up these super simple, but so very useful drawstring bags for her. Can you tell we're totally into cats these days? 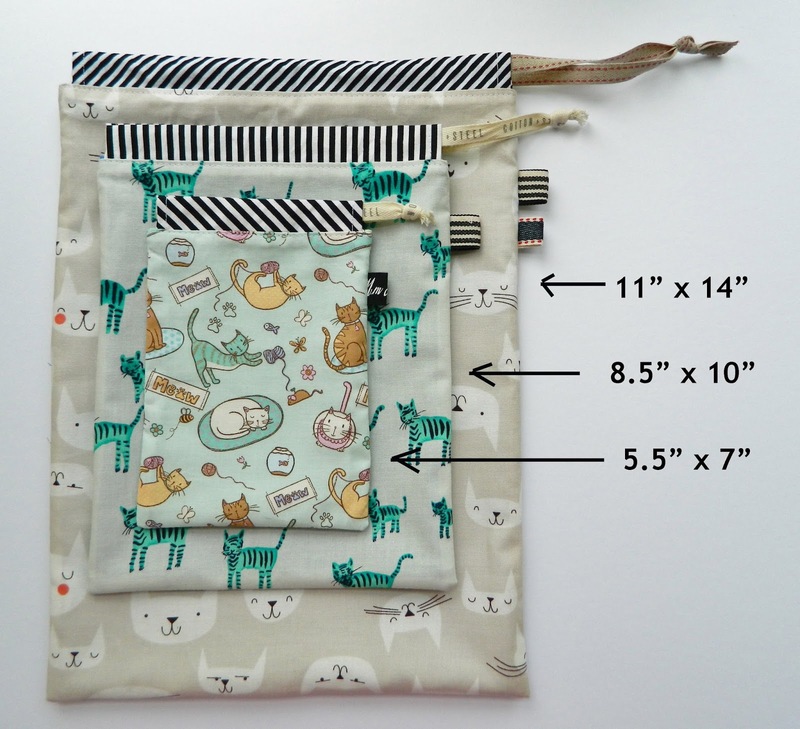 I used my drawstring bag tutorial (it's free and you can find it here). I scaled the original pattern up and down to also make a larger and a smaller versions of this bag. I'm still thinking of making a few larger bags for her because these are so much prettier than any ziplock bag can ever be :). So cute!! And so perfect for packing. These definitely beat the Ziplocs I use! I'm right there with you loving the cat fabric! These are so handy for packing, great idea! Your bags are beautiful, such a great way to use fun fabrics. I always love your bags Svetlana. I have a niece who is into cats too! Your fabric choices are always divine. I bet child#2 loves these! These are just delightful Svetlana! I especially love the striped bindings! These would make awesome gifts! You can simply swap the fabric to match a person's tastes. Love them! these are great patterns. Thank you for sharing. Going to dust off the sewing machine and give these a try. Your bags are beautiful! Great idea for camp! All of her friends will want some for their own now! Oh what a great idea! Can you figure out a way to put two straps on a drawstring bag so it can be worn as a backpack when the straps are tightened? My girls go to art camp too and I made them adorable skirts out of paint by carrie bloomston but matching bags would be awesome!!!!!!! I have to say I love your drawstring bag tutorial. I use it often to make so many different sized bags. 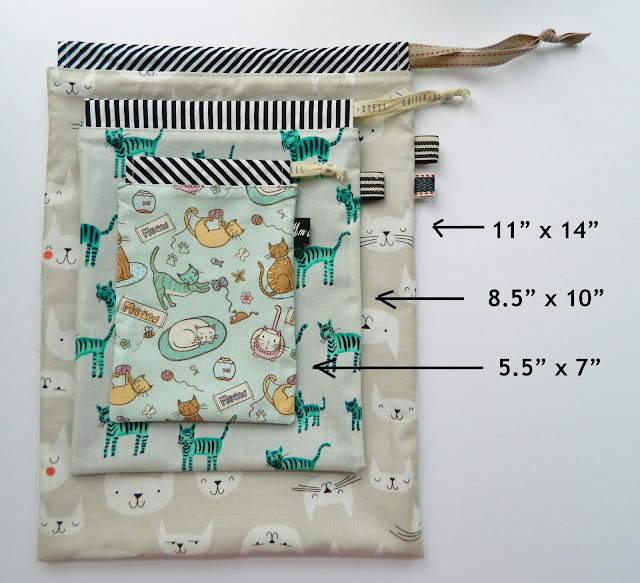 I have made a few to keep car toys in for my boys, and they are great for gift giving too. I made my SIL a beautiful drawstring bag to hold her b-day gifts and a matching zipper pouch (one of your patterns). I have plans to make Halloween treat bags for them and their friends too. They're so much fun to make! Those are some great designs! I think handmade bags and other accesories are an important part of the personality of some girls, and define them as creative and unique people!